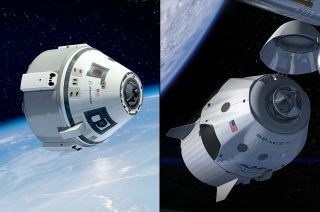 Boeing's Starliner spacecraft (left) and SpaceX's Crew Dragon are part of NASA's Commercial Crew Program to bring astronauts to the International Space Station. Today (Aug. 3), NASA will announce the first astronauts who will fly in SpaceX and Boeing spacecraft for the agency's Commercial Crew Program). The first crewed test flights, which will use Boeing's CST-100 Starliner and SpaceX's Crew Dragon vehicles, are currently scheduled for 2019. The announcement will be broadcast live at 11 a.m. EDT (1500 GMT) from Johnson Space Center (JSC) in Houston, and you can watch it live here on Space.com, courtesy of NASA TV. The event will feature NASA Administrator Jim Bridenstine, JSC Director Mark Geyer and Kennedy Space Center Director Bob Cabana. Representatives from Boeing and SpaceX will also participate, NASA officials have said. SpaceX will use two NASA astronauts on its Crew Dragon flights, whereas Boeing plans to use one NASA astronaut and one Boeing test pilot, Jeff Foust reported for SpaceNews last year. Industry insiders have said that the Boeing crewmember will likely be former NASA astronaut Chris Ferguson, who commanded the final space shuttle flight in 2011 and is now director of Starliner's crew and mission systems, Foust wrote. The SpaceX and Boeing spacecraft will both eventually launch from Florida, marking the first astronaut liftoffs from American soil since that shuttle mission, according to NASA. (NASA is already renovating the astronaut departure lounge at Kennedy Space Center.) Currently, all astronauts and cosmonauts heading to space ride Russia's Soyuz spacecraft, which lifts off from the Baikonur Cosmodrome in Kazakhstan. NASA hasn't committed to buying seats for its astronauts on Soyuz spacecraft beyond 2019, so other options to access the station will soon be essential. NASA's Commercial Crew Program has created a path to approval for the Crew Dragon, which will fly on SpaceX's Falcon 9 rocket, and Starliner, which will ride United Launch Alliance's Atlas V rocket, to eventually deliver humans to the space station. Another version of the Dragon spacecraft has been bringing cargo to the station since 2012. The selected astronauts will take questions on Reddit after the announcement, starting at 12:30 p.m. EDT (1630 GMT).